Last edited by yoitisi; January 29th, 2008 at 06:16 AM. Joey-B: Since yours was marked as a WIP I didn't take it to poll. Looked promising though. Shera 3000: With all the goodwill I have I couldn't take yours to poll. As I've said in previous rounds, pulling of a sideview is sometimes harder than doing it in 3d. If you'd gone for one of the earlier sketches with perspective I think you would have had a far better result this round. 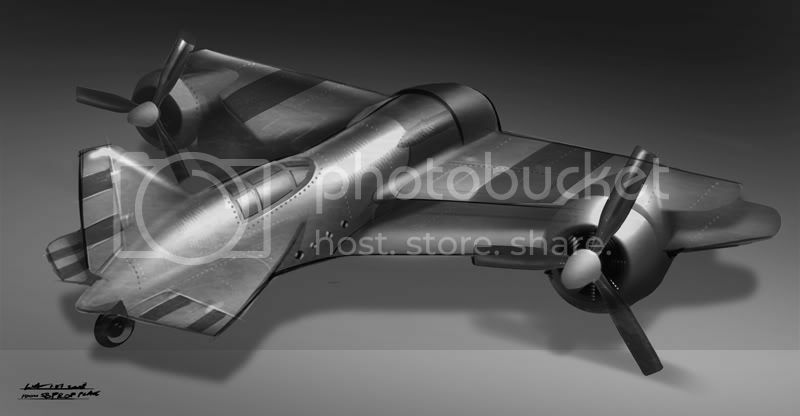 As it is, it lacked real shape and shading, the propeller was out of perspective and the overall design a little too much modern to really fit the time as stated in the brief (especially the closed cockpit caused this). You might want to check out the mentoring thread in my link if you feel unsure about your perspective drawings. ChristianWeeks: As a newcomer in these parts I granted you a place in the poll, despite the perspective issues and all. I saw you already got some usefull critiques, but I think you'll get some more in here. I have the suspicion some people couldn't get their finals across because of the technical issues with the implementation of CA 4.0, but I decided to put up the poll even so. Try to contact other people who can post your work or can contact me and I'll see if I can squeeze you in on the poll. My vote went to D-Holme. Enjoyed the story/description behind the concept; it sealed the deal for me. Btw, Yoitisi, how is final posting done on IDW? I had one ready to go for this topic but was waiting for a "final burn" link like in COW...I'd like to submit something in the future since this one is already closed. I dont know why I should throw my 2 cents in as I didnt participate, so, take my crits with a grain of salt, as always. I actually kept going between a handful for different reasons, there were a bunch of good ideas. D-Holme: True to form, even though not steam punk, you can look at it and know its your style. To me its only a shade outside believable, and looks good. no real negatives. And the story was cool. Timothee: That was a hard perspective and you pulled it off pretty well. I like the amphibean idea as well. a good piece, not real negatives here either. ScaryPotato: Cute little piece. I assume its suppose to be a race thing. but you dont clarify that anywhere and nothing really stands out. hallo: Nice whimsical piece. The gold was a little much for me, but thats just a personal taste. again, no description leaving me wondering. make a good cartoon though. Migsta: Almost got my vote. for me this was a little to WWII instead of a tweener. but the design, and the detail is great. I liked the whole concept and thought it was well done. ChristianWeeks: Well, we know you struggled with the perspective, nothing wrong with that. it is afterall, what these challenges are for. what does not kill you (or make you give up) makes you stronger. the design idea was ok, nothing special, but not bad. so just take it as a learning tool. Orion9282: Nice design, something i would think you would have seen closer to the middle of WWII and not between the wars. It looks a little heavy for the wing size, just my opinion. Legato: Got my vote. to me, this one encapsulated the theme, and was done really cleanly. one of the cleanest paintings I can remember seeing by you. I liked the midship design concept, and the wings and strut style simply left it looking very WWI ish, which I liked, but it was so crisp that it looked like it was a next step. well done. I would have liked to seen a write up like D-Holme, whos was a close second along with Migsta. D-Holme has my vote this round..
uh..ok, a little harsh I think but I respect your decision. I will say that I thought I was following the brief as I only researched pre wwII planes for this design--most of which had closed cockpits...but oh well, onward and upward! Timothee>>I liked this design but I would've like to have seen a different viewpoint for your final as I enjoyed looking at your ortho sketches--also the upper left hand corner of the the front loading hatch looks like it should be lower to me. ScaryPotato>>Nice design, but the silhouette figure detracts from the design. hallo>>Well painted, liked your use of texture, the design itself almost has a sort of futuristic feel to it, almost voted for this one. ChristianWeeks>>Nice start, looks like you addressed some of the crits that were in the other thread, but it still looks somewhat unfinished to me. Orion9282>>This one looks a little unfinished as well as there is something about the front and left side of the plane that looks a little off to me. But I like the overall design. Legato>>Solid design, probably the best one but I'm not really feeling the yellow color for the plane, a little to bold for my taste. I would've liked to have seen a lighter color or a different hue of the color you chose. Overall good round for a great topic! There were some real interesting takes on the subject, and it was hard choosing just one. I voted for Legato's piece, it fit the style of that era, and it was well executed. Shera3000- I appreciate the crit, I was trying to find an angle that could best show the plane as a whole. Last edited by timothee; January 29th, 2008 at 03:38 AM. You can work now and play later, or play now and work later. First of all, I missed an indication of the shape of the fuselage. I think you meant it to be more or less cilindrical, but to convey that in a sideview it would need some shading and highlights as shown in the little cilinder I painted there. You can easily see this in the picture as well. Another important trick to make a difference between underside and the upperside is shading and shadow is really important. Notice how the underside of the wing is really dark, while the surface facing the sky is really light. Again, I missed this in your image. Third is the shadows of the wings and other details on the fuselage. Not only will this emphasize the shape of the fuselage itself, but also shows that the wing is sticking out of the fuselage. You got a tiny shadow under the wing at the back, but as you can see in the example making it bigger works far stronger. PLEASE READ MY SELF CRITIQUE!!! its really quite awesome how your pieces always come into their own, both stylistically, and color wise. Also, its really nice seeing the angle you gave this, as it really shows off every aspect of the design really well! That being said, it also brings into focus the picture’s main weakness, that being perspective. As it stands there is some pretty major warping to the right wings and engines in size, and to all square implementations in regard to vanishing point. The lower right wing especially appears longer than the left wing, and I think you might have realized that when it came to the end struts. Also the upper right engine appears bigger than the one that is closer. Other than that however this has a really strong form to it, and I would say it is easily one of the best submissions I’ve seen from you thus far! I must say, I am really impressed with this idea. I can’t say I’ve ever seen anything like this in function or in form. The mental image of these things swooping down and skidding to a stop on the beach is pretty epic, although I would imagine the front of that would we as heavy as a lead block with the reinforcements it would need. Mechanically I would have liked to see bigger pontoons to bring this more into the realm of believability, and not only is the front door far too small, but the hydraulic/pneumatic rams you have responsible for opening it and shutting it simply wouldn’t work. Those would only telescope 40% or so of their full length so if you follow that angle up the door would only close just barely horizontal with the ground. Of a more minor note, stylistically I think the double wide windows give this a little too much weight and betray the form of the craft. Perspective be damned but you could almost chop off he right windows (our left) and I think it would give it a more plain feeling. On a final note, while this angle is fine, it really foreshortens 90% of the plane, and while im sure the major point of interest is the ramp and forward area, you almost don’t show enough of it to justify the angle you have chosen. this is the rendering I wish I had. I only really had time and the presence of mind to render mine out with base and shadow, but you have such a minimalistic approach and yet go so far with the highlights I feel pretty lousy with what I ended up with. The way you brought out the riveting lines especially is a really nice touch, but it doesn’t quite push this over the threshold for my vote. Mainly in part due the the attempted but not focused on background, but also in part to a few mechanical details. I would have liked to see a more traditional engine, rather than the ‘train’ look you have now. Most engines of this era had a large circular feel with plenty of intakes to cool the engine. Also, the scale of the craft is slightly in question, as this is currently the shriner car of the airplane world… which isn’t so bad, other than what technology of that day was capable of doing. Unfortunately this is one of the few planes that I have to discount due to the topic’s specificity. Simply put, this doesn’t seem like anything from pre world war 2, in fact, it looks like one of the more retro feeling things from starwars just with a propeller on the front. The background and rendering don’t help this, as you feel like you are doing the trench run out of the deathstar! Don’t be confused and think its bad, theres actually a few design decisions you took that would be quite nice if it was for a different topic. I especially like the intake pattern on the front. In terms of perspective watch out for the right (our left) wing, its sticking out too far, or rather, I think the other wing isn’t long enough. great rendering, great simple yet effective idea! I really like the modified nature of the craft, and like d-holmes plane the idea of a boat plain with an actual boat on board is really nice! 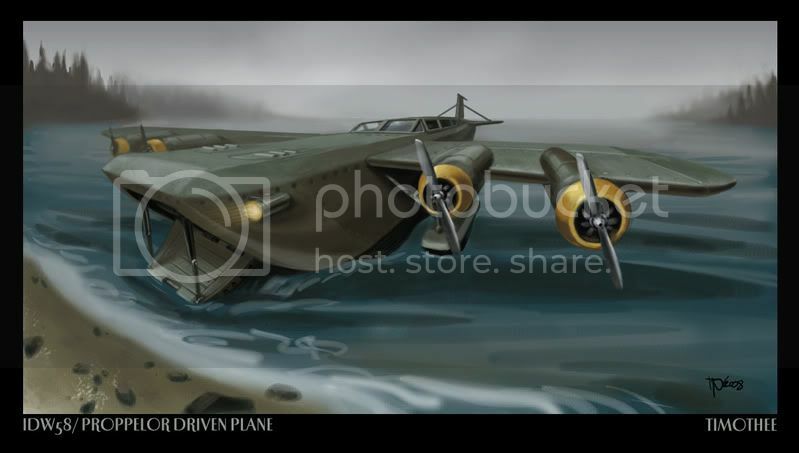 In regard to crit, I would first beat the dead horse by saying the side view really is lack luster, and your last ditch effort to put some perspective into it by raising the other pontoon up only hurts the rest of the plane because nothing else is shown in this way. Also, while I have no room to talk in presentation, the inclusion of the two lower planes doesn’t really add to the final piece, as they aren’t different in any way other than completion. I would have liked either a strict front/top view or nothing at all. I think you are already aware of the funk going on with your perspective so I won’t really say anything about that other than you now know what to do and you have the opportunity to work on that for the next piece. However I will talk a bit about the mechanics of this. I can see by the color that this plane was intended to be sort of a red baron 2.0 attempt but I wonder if you took any reference into how planes of this era were actually constructed. For instance, the rear tail wings aren’t at all styled like they would be if this was something that actually existed. For one, the ends are completely flat, something I had on my plane for a few minutes as a thumbnail. Also they are very close together, even in perspective, and the two rear props, which I only just noticed are too small, both in engine and in blades. The rear fuselage turns into what appears to be a cube, while the front of the plane maintains a cylindrical shape. The forward wing engines are shaped unlike anything I have ever seen and I wonder how a piston motor is fit into them, and again their blades are too small. The landing gear should be fleshed out a bit more as well. Ultimately I would say besides working on perspective, you need to work on your straight lines and line weight. If your using a mouse, learn Photoshop’s shift click stuff (which you’ve already been told about) but also if your using a tablet either rotate the canvas, or learn how to contort your entire body to figure in your natural lines! Don’t give up however, keep on working on it. My vote went to you despite the almost ww2 time frame this plane reminds me of. My plane as well pushed those boundaries and your plane makes a great transition piece from the era of the biplane to the more traditional mustang/spitfire look that most people recognize. When they think of ww2. The rendering is nice and clean but without too much time taken to push it to a level it’s not on. Really in terms of critique there is not much. Mainly I would have liked to see it in a different angle, however what you have here is really class, I really want to see what the intakes for the engines and the front of the craft look like! As I’ve said before, when a topic is this straight forward and open you really only have two options to how you approach the design. This was actually my first thumbnail and I went at it with the intent of creating something new that looked like it could work. That being said I also filled up a few pages in my sketchbook coming from the other method, which is to come up with an interesting problem that would need a new form to solve it. Since I’ve never really drawn an airplane, or for that matter, drawn an airplane from the 1930’s I got a few reference pictures, which really guided me in terms of how biplane wings worked, but like Orion’s piece I really wanted to hint at a transition design between ww1 and ww2. If there’s anything I feel I did poorly it was the actual rendering. I didn’t have too much time and in retrospect, I really wish I had given it the attention and care that ScaryPotato did while still keeping the clean sorta “promotional poster” image of the actual craft. Last edited by Legato; January 29th, 2008 at 05:40 PM. JUst had to vote Migsta cause its so well rendered and i like the design..
My Sketchbook wich i try to update daily! interesting design. i like the watercolor style and palette you went for. 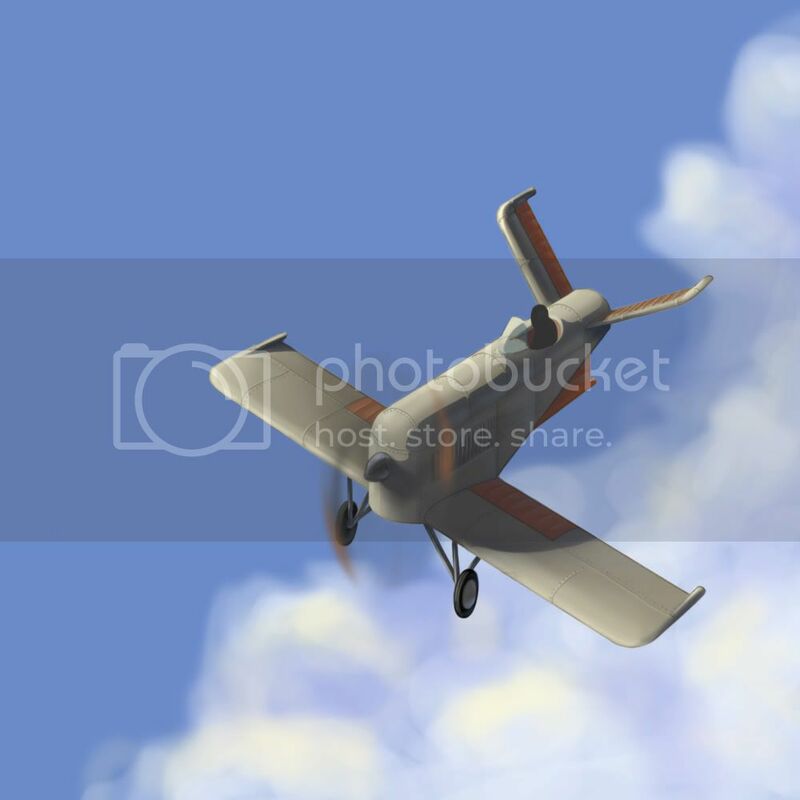 one minor nitpick: the way the propellers are rendered doesn't fit the rest of the picture too well, in my opinion. regardless, another fine work of yours. seconding Legato, i think your image suffers a bit from the extreme one point perspective. there's also a nasty tangent concerning the canopy/horizon line (at least for me). the plane's got a cool design. i mean, you simply can't go wrong with seaplanes. cute design, lovely colors, clean style. nice. unfortunately, i also find it a bit boring. cropping a good portion of the background (on a sidenote, that's what i should've done, too) and a more dramatic angle might've pushed the image, perhaps? i almost voted for yours. i love the details and the sharpness of your piece. add the seaplane factor (see above), and you've got a killer. shame it's only a sideview... but a really great one. nice start dude, hello and welcome. i won't dig into the perspective issues as they've already been pointed out before. i think your concept's lacking an element to make it stand out as something unique. right now, it actually looks like a biplane with some extra propellers and two additional wings (rudders?). however, the design is clearly pre-ww2, as it was required - well done. keep it up + have fun mate. looking forward to your next entries. you got my vote. intriguing design, mad highlights, thumbs up. your piece was also on my list. i really, really dig the saturated colors (a trademark of yours - i'm sure i'd recognize your style pretty much anywhere on the internet by now). great design. if there was anything i'd change about the image, maybe desaturating the scenery a bit would put the plane more into focus. don't ask me why, but your image reminds me of european comic books, especially french and belgian ones (Tintin, anyone?). Thanks all for the comments and votes. Legato hit it right on the head with what I was trying to go for - a transition phase from WWI to WWII. I think a lot of people are right on target that it might be too close to WWII, and that it's somewhat unfinished. Hopefully this week will be better? I really liked D-Holme's design despite being a bit elaborate... though they did make some ridiculous planes back in the day. Migsta - I love the rendering and the simple raft-carriage design elements that separate it from existing planes. I debated with myself if the concept could be pushed just a bit more... but, this particular topic was a tough balance between appropriateness for the era and pushing conceptual development. Ah im surprised you included mine in the poll! Again, thanks you all for your feedback. I'll be sure to make my next entry (whenever it will be) will be a LOT more polished. Timothee The first thing that I noticed with your picture is that it doesnt look very Pre WW2. Also, I think the shoreline could have used a little more love. However, the picture is nicely done overall and, unlike mine, uses the vanishing point well, so it all looks like the correct perspective. Scary Potato No offense, but yours strikes me first as a flying lawnmower The simple, small design looks good though and fits the simple blue cloudy sky well. Very nicely done. Hallo I love your color! The picture looks like the plane is rocketing out of the sunset and the radial symmetry with all the clouds really adds to the effect. It doesnt seem to fit the time period though Since it is so small, it makes me think of a futuristic flying scooter sort of... Except a lot cooler than a scooter haha. I love yours, very skillfully done. Migsta Everything about yours is great. I love the side view with all the progress pictures. The color is great, shine, shadows, everything polished. The only reason yours didnt get my vote is because it looks too much like any other typical plane, without any creative twists added in. Its definitely the most realistic of all the planes here though. Me augh i wish i had time to finish this Oh well. Timothee – I like the direction the design flowed and the ‘airborne-landing craft’ works well. I think the strong fisheye doesn’t help show the design off to it’s best and within it some of the perspective looks odd the right most engine comes to far forward maybe. ScaryPotato – I like the clarity of the design and the simplicity of the design, the image looks a little off to me almost as if it had been stretched vertically – not sure why though maybe the angle of the wings. Hallo – I like the interesting nature of the design and though quiet incredible it is not totally outside the realm of possibility. The propeller disc looks a little too perfect and though I quite like the single colour image I’m not sure whether some of the design gets lost with it. The bright burst might draw the eye a little too much maybe if it was slightly smaller then some highlights on the plane could draw the eye over the points of interest on the plane. Migsta – I like the cleanness of the rendition and the design has nice points of interest. I wonder that the style/technology of the plane might be a little too modern, the plane just looks a little too large and solid to be pre-war. It’s been said by other people but I have to agree that the visible back float looks a little odd. I don’t mind the flat perspective so much as with a plane that has it’s strongest silhouette is only along the side axis. ChristianWeeks – I think plenty of people have offered advice on the perspective so I’ll leave that. The design could have been helped perhaps by a better handle on the engineering of the plane, a bit more study of reference would have helped it come together – details like the engines on the tail just look very tagged on, without any supporting structure. A good try, I’ll look forward to seeing how things come on for you. Orion9282 – The idea behind the design looks strong, for some kind of high performance bi-plane. I like the metallic finish but wonder that some little splashes of colour might help bring the design out and highlight places of interest. The shape of the front looks like there should be a prop’ there too? Legato – I think others have said the same but this (if I hadn’t seen this weeks entry) is the best work you’ve done so far. I think some highlighting might have helped the design be even stronger but the bold colour-scheme come across well and keeps the attention on the craft (and the background colour and disposition helps the composition). My main critique would be the cockpit looks very modern with the single large spans of glass – might have looked more period with a smaller sub-division. Thanks for everyone who commented or voted for me. Legato you’re right about the engine size being out. The perspective on the tail looks wrong but I don’t think it’s as bad as it seems, checking, it looks like the lines of the tail exasperate the look of the problem. The wings are out too – the amount of time I spent tweaking them back and forth is annoying that there are still mistakes but I guess after a while you start to miss things without fresh eyes.